Sleep is one of the big topics when it comes to babies. Here's just a few tips to make sure your baby is getting enough of it and how to manage the lack of sleep new parents suffer from as a consequence. The single most important tip is to help your baby to settle himself to sleep. If he can go to sleep by himself in the first place, he's much more likely to be able to resettle himself during the night or during his daytime nap. 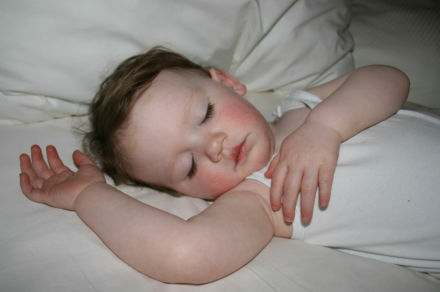 A darkened environment is essential for many babies to sleep, especially as they get older. When your baby comes into a light sleep during the nap, if it's dark he or she is more likely to resettle himself back and continue to have a longer and more restful sleep. Consider blackout blinds or lined curtains. A familiar environment is very important. The more you can do to make your baby feel safe and secure, the more relaxed they will feel and more easily they will sleep. These are called sleep associations: darkness, familiar bedding, scents, toys, music or cuddles - whichever you usually use. All these help your baby to know that it's sleep time and so to settle more easily. So no matter where you are, once in his cosy, darkened cot he'll feel able to sleep. If you can, use some time while baby is sleeping to recharge your own batteries too. This, in particular, was a top tip for me when my twins were babies - it made such a difference!